You are readingIlluminate Your Workspace With A Cool Lightsaber Lamp! Illuminate Your Workspace With A Cool Lightsaber Lamp! All you Star Wars fans out there might have already had enough of your share of all the Star Wars goodies and gadgets, but then again if you look back you realize that its never enough and you are always hungry for more. 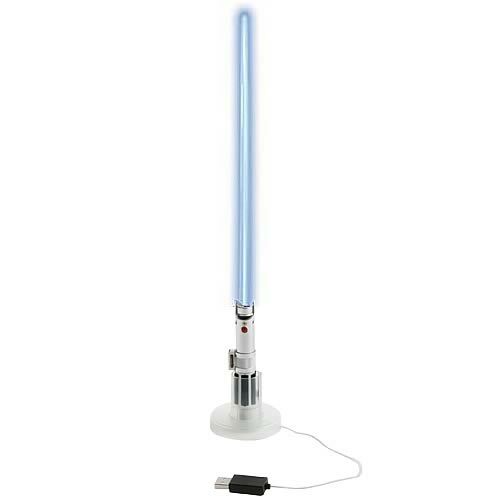 So just considering that all your previous Star Wars stuff were just the appetizers prepare yourselves for the main course that includes a whole new arsenal of cool gadgets like this USB Light-saber Table Lamp. If you are a true Star Wars fan then there is absolutely no way that you haven’t every thought of owning your own light-saber, but most of then ones available in the markets are probably for the kids, so then what does an adult do in such a situation?, well he gets himself one of the USB Light-Saber Lamps, something that will satisfy his hunger and not leave him looking all dumb. Selling for just $29.99 this cool light-saber has adjustable illumination and recharges in an instant or you could also check out some of the other cool Star Wars stuff like the FX Light-Sabers and the Vader TIE Fighter model.